VLCC Salon Series Wheat Massage Cream Controls Pre-mature Ageing Of Skin, Nourishes & Rejuvenates Skin, Reduce Anti-Wrinkles. 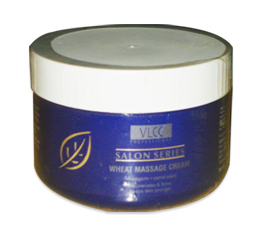 Wheat Massage Cream From VLCC Online Shop. Rejuvenates & firms, keeps skin younger. After cleansing the face, apply this cream generously all over the face and neck. Massage gently using upward strokes for 8-10 minutes.